I never get bored of seeing this flatbed Ford and the trailer stacked so perfectly with Dungeness crab pots. It’s such nice gear, bright and beautiful, and each time George shows up with a load like this it’s like I’ve never seen it before. 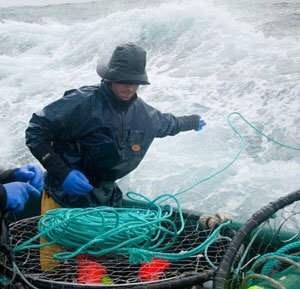 And I tell you what; our Dungeness crab season may have drawn to a close but these guys never stop working. They are currently busy with forklifts and hydraulics, pots, line, and buoys, running back and forth between boat and web locker. 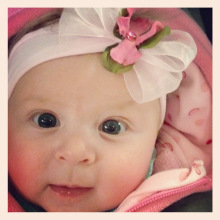 My angel of a babysitter, Allison, is here for a couple of hours this afternoon to play with Eva and Vincent. This means that I’m able to sit downstairs, catch up on work, and have a few moments to listen to music and think in peace. Unfortunately, I am about two seconds from falling totally asleep, and I still have to go teach Jazzercise this evening. Since I also need to keep up with my week-long daily blogging challenge, I figured this would be a perfect time to share a few of my tips. 1. Don’t overbook yourself. I purposely keep activities, classes, play dates, commitments, appointments, and things we “have” to do at the barest minimum. It takes a lot of energy getting two toddlers ready to go anywhere and if we “have” to be someplace all the time, it stresses all of us out. I like to do one activity outside the house just every couple of days and spend most of our time taking things slowly and enjoying our time together. 2. Don’t let anyone judge you. Never, ever let anyone frown upon you for not being able to keep every single commitment or for wanting to stay at home at night or leave functions early. Especially if those people have spouses that are home every evening and on the weekends. 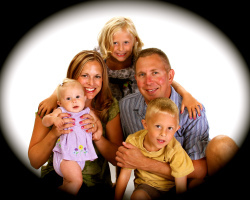 You are the only parent on duty, and you operate on an entirely different schedule from them. 3. When your kids are resting, rest yourself. It’s the same advice every new mother receives when she has an infant: sleep when the baby sleeps. I still hold to the advice even though my youngest baby is two. When Vincent naps, I grab Eva and rest with her. If your children don’t take naps, set them up with a project or Sesame Street and take a time out, because you need it. Even if it’s 4:00 p.m., you have seven more hours of working alone ahead of you until your day is complete. 4. Encourage your spouse. When your husband calls (or if he answers the phone when you call) don’t start in on how tired and frustrated you are, or how tough it is. Chances are very good that he is also tired, frustrated, and working hard. You’d do well to encourage each other instead of stealing whatever bit of energy each of you has left. I’ve found that decent places to go and share your frustrations are Facebook and Twitter. 5. Be Cowgirl Tough: No Whinin’ or Cryin’. I have a sweatshirt with that written on the front, and I love it. Equally important is to not associate with others that do whine and cry. Don’t let their negativity steal your joy, your energy, or your pride in what you are doing and building. 6. Find a loving babysitter. Everyone in my family loves Allison. Not only is she always willing to come over, but she comes with a quiet joy and actually works on projects with the kids, makes crafts with them, and plays. She doesn’t just supervise; she’s involved. She also cleans as they go, which lightens my load. Finding a babysitter was a big step, but a necessary one, and my only regret is that I didn’t do it sooner. 7. Accept All Help When it’s Offered. When your parents, siblings, or friends come along and offer to take one or both of your children to lunch, to the park, to ballet, or to come make cookies at their house, take them up on it. Even if you feel great and have everything under control, your kids need the break and so do you. Alright, there’s all my unsolicited advice. I hope you enjoyed it. Now, it’s back to the upstairs to my babes and the pups, and calling George to see how close to home he’s getting. Should only be a couple of days now! 1. Hair mascara from Claire’s. Eva and I have had the most fun painting little streaks of hot pink in our hair for the past few days! 2. Circuit Jazzercise. I can’t even tell you how much I love teaching this format and the way it feels to experience instant results. 3. Vincent’s continuing return to health. 4. George’s exceptionally cheerful phone call this morning to let me know he’d just “crossed the bar” and would be arriving home in a few days. 5. Every single song on all three of country music singer Jason Aldean’s CDs. I’d had big plans to finally go to Costco today. But in the end, I decided that taking the kids to the farm to visit Grandpa working was a better idea. We spent the entire afternoon taking a walk through the woods, looking at the pond and acres of land, and inspecting the tractor. George called while we were out there; he was getting ready to head back to sea to pick up the last of the crab pots and then bring the boat back to town. 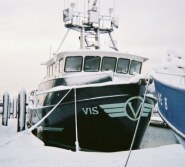 This is a good time for him to shut the door on the 2010 crab season, because Halibut/Blackcod 2010 starts on March 6! That gives George about ten days at home before leaving to spend the next few months catching IFQ all over Alaska. I admit this is probably going to be one extremely long spring, even for me, who considers herself to be pretty tough and is very used to this. Later in the week I plan to post a few of my personal husband-is-at-sea coping strategies. Signing off (from my iPhone in the kitchen) from Day One of my weeklong blogging challenge. See you tomorrow! If you read the last post, you know that it was recommended I write something on this blog every day, or at least every other day. Now, I’m a good sport and enjoy an interesting experiment, so this week–for the first time ever–I’m going to put something up on this blog every single day. 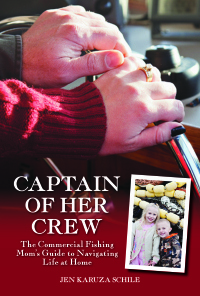 For one week, everyone will get to read about the real day-to-day in the life of one commercial fishing family. Speaking of Vincent, he finally seems to be on the mend from two months of scary ailments. I’m so relieved about that. My own throat is starting to swell up now, but no matter. I’ll double up on the Wellness Blend tonight and keep forging ahead like any good mommy would do. I did not make it to Costco today; didn’t want to deal with crowds and rain, so the kids and I went to the Farmer’s Co-op to eat popcorn and buy dog treats. I did teach Jazzercise this morning and wore myself out. That was one awesome and tough class! I gave the customers the option of using either weights or a tube during the strength segment and was happy to see that over half of them chose the tube. I have not spoken with George today. I think he is still dealing with the crab gear and wrapping it up. Oh–and the new sheets I bought yesterday are beyond wonderful. Can’t wait to jump back in my bed tonight! 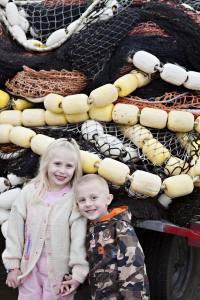 Goodbye Dungeness Crab, Hello Halibut! I recently used a web-based grader to test the effectiveness of both this blog and my personal website. One thing that stood out in the final report was that “they” told me I only write an average of two blog posts per week. The mystery grader let me know I’d be more effective if I posted something on my blog every day or at the very least, every other day. But in some REALLY interesting news…after nine years of faithful service, our bathroom scale finally died. Not to worry—I raced over to Bed Bath & Beyond this afternoon to find another one. And now, not only do I have a brand new scale that shows weight, water, and body fat totals, I also have three new sets of sheets for my bed, a package of turbie twists for my hair, a mirror for our closet door, and a present for my sister. George came home last night for a few hours to store some bags of buoys and line in his web locker. I snapped a picture of him before he left, which I’m posting here. Tune into this blog tomorrow to read all about teaching Jazzercise and going to Costco! It’s been a whirlwind last ten days. George made a couple of local Dungeness crab deliveries, so we traveled to meet him at one local port for the night, and then a few days later, he came home for two nights. The night we traveled to met him was incredibly fun. We had a big crew dinner followed by entertainment you just couldn’t put a price on, and the kids loved the hotel. They had so much fun running down the carpeted hallway in their socks to the vending and ice machines and sitting at the little table in our room to eat their special treats. George needed a couple of days to regroup at home, so I am glad he was able to get here. He’s been burning the midnight oil without any sleep and working harder than anyone could imagine. We also had a rather unexpected and disappointing shuffle on the boat, so it was nice to get some time together to sort through it and make some sense of it. Everyone knows that I really can’t stand change, especially when things seem to be moving along well. 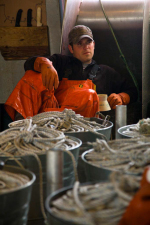 What could be better than a great crab season that’s about to end and a great longline season coming up shortly? Everyone also knows that we love George’s crew like our own family. 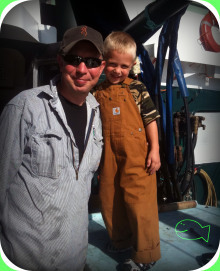 That’s my favorite part about the smaller fishing family business as opposed to the huge factory boat business; everyone does become like family. You spend a ton of time together, have things in common, have lots of laughs, and create memories season after season and year after year. 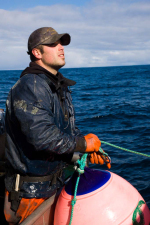 Speaking of crew, I just read today in the news that one of George’s old Bering Sea friends and crewmates from his Alaskan Leader/Bristol Leader/Shemya years was airlifted off the Alaskan Leader fishing vessel while at sea due to chest pains. I met that guy around the same time I met George, and even flew to Dutch Harbor with him a couple of times to meet George and the boat. 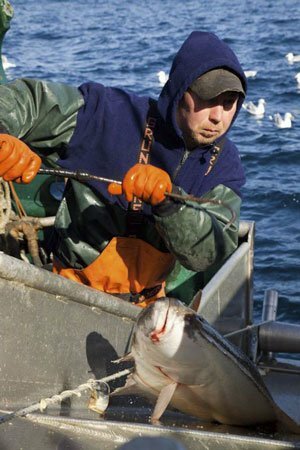 And for your information…this year’s commercial Alaska halibut season begins on March 6. That is about 15 days earlier than last year. 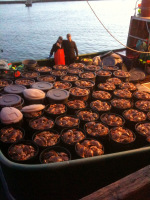 I think that will give George about one week at home in between the crab and longline seasons. Ah, well. ‘Tis the life we love, right? Love you all and thank you. Trish, thanks again. Reading a comment like this helps us all keep pressing toward the goal. 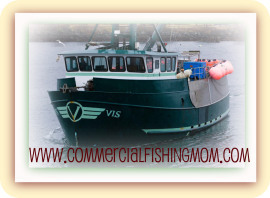 This might be a good time to mention to everyone that if you are on Facebook and interested in commercial fishing, there are a few great commercial fishing groups you’ll want to join. 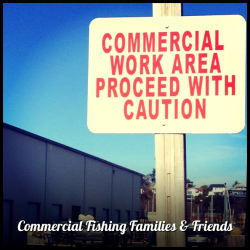 You’ll find discussions, comments, pictures, and notices of events and happenings going on in national and local fishing communities in all of these groups. Feel free to “friend” me on Facebook or “follow” me on Twitter and let me know of other groups that may be of interest to us all! Dungeness crab ready to be sold in the live market. Bryan and Brett with Dungeness crab ready to go.